If you find that you always forget to empty the dust bin on your robot vacuum before you go to work and it stops cleaning because the bin is full, then this iRobot Roomba i7+ Robot Vacuum will be the perfect option for you to rid yourself of this particular frustration. If you love technology and the latest gadgets or have a smart home this will fit in easily and let you ask it to go and clean. With the ability to name the rooms which get mapped when cleaning you will even be able to ask Alexa to send it to clean a specific room. Cleaning is now getting easier for every busy person and that’s all of us isn’t it? The design of the Roomba i7+ is the standard Roomba circular shape but this one is made with a black, shiny exterior which looks very smart. It has the standard 3 buttons on the top so you can set it cleaning manually with the clean button or send it back to the base with the home button. The third is the spot clean button for if you have a spill. Using the standard Roomba design the body of the vacuum sits at 3.6 inches high and can fit under any furniture that has a minimum of 4 inches of space. So what’s different on this new Roomba i7+ that’s not already covered in the Roomba 980? One of the best features on the Roomba 980 is the strong suction and the dirt detect which makes it one of the best robot vacuums for carpets. You still get that with the new i7+ but they have now added a new set of sensors to make the robot adapt to different types of dirt. There are acoustic sensors which can hear if there is a lot of sand and dirt being sucked up so will move over the area a few times till it cleans it up. When it comes to pet hair the acoustic sensors can’t help but the optical sensors on board can recognise hair on the floor which will automatically boost the suction so it can clean more thoroughly. What this means for you is that you don’t have to decide whether to run it on turbo suction as the robot vacuum will recognise when to use the correct cleaning function for the area being cleaned. The Roomba 980 might just have some competition for being the best Roomba for pet hair. The drop sensors which stop it from falling down the stairs often cause trouble with black lines on carpets or dark floors but these have been improved on this i7+ to give less issues. This iRobot i7+ can work on all floor types, whether you just have one type of floor covering or a mix of both carpeting and hardwood. The vacuum will automatically adjust height with the spring loaded wheels to keep the suction close to the floor. The wheels are also large enough to allow the cleaner to move over different levels so it can manage the step up onto a rug from hard floor with no issues. It has 2 rubber rotary brushes underneath which work together to loosen and pick up dirt. There is also a little spinning side brush which works to get at any dirt that gets into the edges and corners of the room. All of the dirt is directed into the vacuum suction, through the filter and into the dust bin. You’ll find that the dust bin is a bit different to other Roomba vacuums because it has been designed to fit over the suction point on the new Clean Base. It has a new shaped filter which is denser and can pick up more allergen particles. The new design also allows you to wash this bin out (without the filter in it) which makes handling it much nicer. You don’t have to do this as often and you don’t have to choke yourself with dust as you empty the bin because this clever little cleaner can head over to the new Clean Base docking unit and the dust gets sucked right out of your robot vacuum and into the dust bag inside the Clean Base unit. This can happen because it is literally another upright hoover attached on top of the docking unit with a dust bag in the top of it to collect the dirt. You might wonder why they have gone back to using a bag when most vacuums are now bagless, this is to minimise the dust getting into the air. When you empty the bag out of the top, and you’ll only do this once a month if you clean daily as it holds 30 full dust bins of dirt before it’s full, the pull card covers the opening as you lift it to have a fully sealed bag. Clean, easy and you don’t have the dirty job of knocking the dust out of the bin. The suction vacuum is quite loud, but it only takes about 15 seconds to empty the Roomba i7+ and only does it when the vacuum is full, so not a big issue in my opinion. If you feel that being wi-fi connected so you can control your robot vacuum with your smart phone is important to you, then you won’t be disappointed as this Roomba connects to your phone via an app so that you can set up scheduled cleaning, access maps and get notifications about the progress of your cleaning or if there are any issues. You don’t have to schedule your cleaning but the flexibility of a robot vacuum like the Roomba i7+ means that you have the option to set it cleaning while you’re at work and come home to a clean house or you can manually set it cleaning with your phone controls or even the clean button on the top. If you have an echo device in your home you will be able to benefit from using voice control commands to send your Alexa robot vacuum to go cleaning. If you’re using Google Home then you’re covered too as it can connect to both. After it has mapped it a couple of times it lets you access it through the app and you can name the rooms on the map. Once it knows what part is the living room, kitchen and bedrooms etc you can then schedule your cleaning to suit what you need. For example if you feel you need your living room cleaned on a daily basis you can set that but if you only want the bedrooms done once or twice a week you can also choose that, customising it to clean each room in your home to your requirements. For maintenance you will still need to check the wheels and brushes to make sure they are clear of hair or threads wrapping around them but as this Roomba i7+ can empty itself you don’t need to do that on a daily basis anymore, you can probably get away with checking everything including the filter on a weekly basis and washing out the dustbin. Maintenance is quick and easy. To empty the dust bag in the clean base is just a matter of taking it out and putting it in the bin, replacing with a new one. Simple. The i7+ comes with the vacuum and Clean Base. It also includes a virtual wall which you can use to stop the Roomba moving past it, protecting items or stopping it from entering areas you don’t want it to, like your fireplace. You also get a spare spinning brush, another filter and 2 bags for the clean base, this should keep you going for a couple of months. You can buy extra bags in packs of 3 for around $15. Needless to say this new technology doesn’t come cheaply. You won’t get much change from $1000. If you work and want the benefits of less maintenance with emptying then you might find it worth the extra money. If it’s out of your price range there is another option, the Roomba i7 . 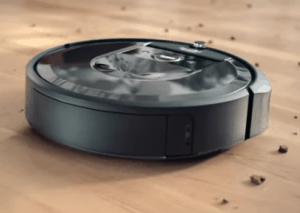 This robot vacuum is the same as the i7+ without the Clean Base. It comes with the standard dock and the dust bin is different as it will just a standard dust bin. This comes in at just under $700. The Clean Base is available to buy as an extra so you could save up and buy it later at just under $300 although you need to be aware it will only work with the iSeries and not any other Roombas. This is a new release so there are not hundreds or reviews yet but from what has been written by customers they love it. The emptying base is a winner with most people and they love the fact that you can name your rooms on the map and schedule the cleaning by room. Having an alexa compatible robot vacuum and google home compatible integrates into most peoples homes where they have voice devices. If there have been any disappointments it’s to do with the fact that the base unit uses bags which is an added cost. I think that the new Roomba i7+ has thought of something that I didn’t know I wanted but now I know I do, a self emptying robot vacuum. I love the fact that it can clean by room if you want it to and it seems everything has improved in some way. I think the cost is high, as most new versions of robot vacuums seem to be, but you do have the option to get all the features of the vacuum without the emptying with the Roomba i7 version which is cheaper. If money is no object then this is a great robot vacuum to go for. Find out more about it here at Best Buy or click the link below for prices at Amazon.